Isaac and Bob present “Entrepreneurship: The Gateway to Growth and Development in the Ghanaian Economy”. You are here: Home / Events / Events / Isaac and Bob present “Entrepreneurship: The Gateway to Growth and Development in the Ghanaian Economy”. Join the AAMI for an evening with Isaac and Bob! 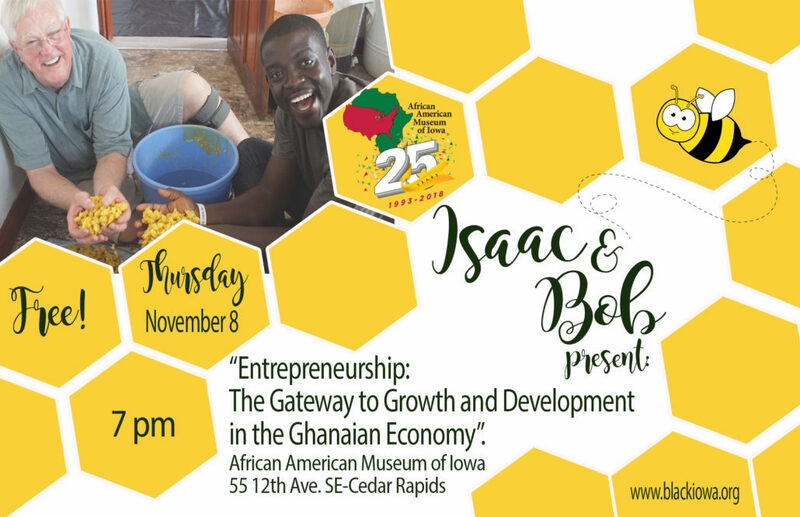 As part of this presentation, Isaac Quaidoo and Bob Wollf will share their experience with their Mandela Washington Fellowship Ghana Iowa Beekeeping Project and promote the Mandela Washington Fellowship experience and programming. Isaac Quaidoo lives in Etufu Ghana and is an Entrepreneur in the field of Agriculture. He is a graduate from the University of Cape Coast Business School in Ghana. He practices both Apiculture and Meliponiculture with focus on honey and bee propolis production. He is the Co-founder of Nexlinks Company Ltd in Ghana. He is the founder of Save the Bee Foundation (SBF GHANA) an Non-Government Organization (NGO) where he promotes beekeeping as an alternative source of livelihood in selected rural farming communities in Ghana. He is an Alumnus of the Mandela Washington Fellowship (MWF) for Young African Leaders Initiative and an alumnus of John Pappajohn Entrepreneurial Center of the University of Iowa. Isaac’s philosophy of life is to help improving health and changing lives. Bob Wolff has lived and worked in Cedar Rapids, Iowa for 34 years, He is an Entrepreneur. He is a graduate of UNL in Lincoln, Nebraska and has owned and operated several small businesses including a B R Honey Co and B Products, a bicycle shop, and a vending machine company. He has been a beekeeper for over 25 years. During those years, he help established and taught beekeeping classes as a volunteer at several locations in the greater Cedar Rapids area including the Indian Creek Nature Center and Wickiup Hill learning Center in Toddville. He has had over 1000 individuals participating in the beekeeping classes. He has also given numerous talks to elementary school classes in the public schools. He worked with the Linn-Mar High School Future Farmers of America (FFA) Ag in the Park field days, demonstrating beekeeping activities. He is an alumnus of the Mandela Washington Fellowship (MWF) Reciprocal Program for Young African Leaders Initiative.